​South Carolina State Police have released dashcam footage from Officer Michael Slager’s car, captured moments before he shot an unarmed black man named Walter Scott. The video shows Scott running away after being pulled over. Made public Thursday by the South Carolina State Law Enforcement Division (SLED), the footage does not reveal any details about the moment unarmed man Walter Scott was killed by officer Michael Slager. The video begins with 33-year-old Slager, a North Charleston police officer, pulling over Walter Scott, 50, for a busted tail light. Slager tells Scott why he pulled him over after asking for his license and registration, and a brief conversation ensues over whether Scott has car insurance. After Slager returns to his police car, Scott can be seen opening his door. Slager tells Scott to go back inside his vehicle, which he does. A few moments later, Scott opens his door again and runs away. 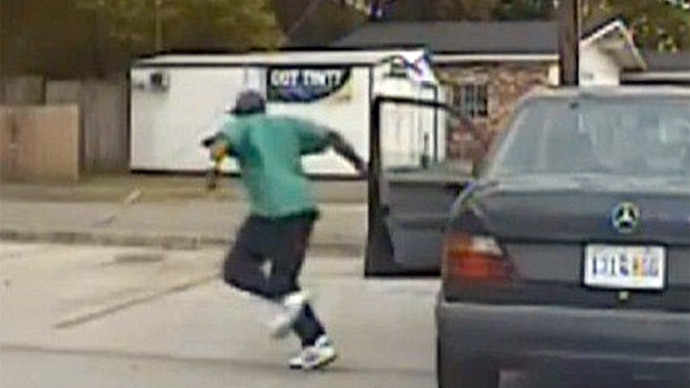 Slager gives chase, but the encounter then moves beyond the dashcam’s range. Release of the footage comes as law enforcement's account of the incident continues to face serious scrutiny from the public and the media. Earlier this week, the New York Times published a video recording of the actual shooting, which was recorded by a third party. In that video, Officer Slager can be seen shooting Scott eight times in the back as he runs away. Slager was charged with murder on Tuesday. He was fired from the force on Wednesday. According to the police report on the incident, Slager said that at some point during the incident Scott took his Taser. Neither video shows such a struggle occurring, but the witness who filmed the incident on his own, Feidin Santana told NBC that he saw the two struggling on the ground before he started recording. "I remember the police (officer) had control of the situation. He had control of Scott," Santana said. He also said he never saw Scott take the officer's Taser. Before Slager shoots Scott, a dark object can be seen falling to the ground. Whether it is the Taser is unknown. After shooting Scott, Slager walks towards him and drops a dark object. It is also unknown if this is the Taser. Slager may also have picked up the dark object and placed it near Scott's body. On #WalterScott dash cam video, retired #CMPD tells me Slager prob touched car to leave his fingerprint. It’s (pre-dash cam) tactical move. — Molly Grantham WBTV (@MollyGrantham) April 9, 2015. Police reports also stated that officers attempted to revive Scott via CPR, though Santana told MSNBC that, if true, he didn't see it. Speaking with MSNBC, Scott's relatives said they planned on bringing a lawsuit against Slager, the police and the city.